Pop star Michael Jackson is to help develop a US stage musical based on the video to his hit song Thriller, it has been announced. Producer James Nederlander, whose company owns nine Broadway theatres, said the star would "participate in every aspect of the creative process". Jackson's spokesman said the singer and Mr Nederlander "represent live theatre and musical excellence". Jackson was not involved in current West End production Thriller - Live. The show, which is being staged at London's Lyric Theatre, opened earlier this month, and its premiere was attended by Jackson's brother Tito. Mr Nederlander's organisation said the Broadway production "will be the exclusive Michael Jackson authorised version of Thriller." 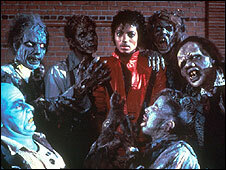 The show is expected to be based around the video for Thriller, which was first shown in 1983 and starred Jackson as a werewolf and featured dancing zombies. No details of the musical have yet been revealed, but it is thought the stage show will also feature songs from Jackson's 1979 album Off The Wall. 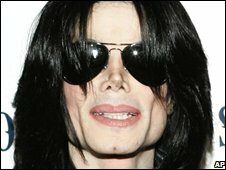 In November, Jackson reached an out of court settlement with an Arab sheikh who claimed the singer had reneged on an entertainment contract worth £4.7m 2005. Bahraini royal Sheikh Abdulla Bin Hamad Bin Isa Al-Khalifa told London's High Court that he had planned to revive the star's career with productions including albums and a stage play. He said that no project had ever been finalised.